“Communicate, Run, Vote!”—Will Women’s March Energy Flip Congress? Women and girls at the Women’s March to the Polls last month carried many great signs, but one that resonated was carried by a young girl in Wonder Woman regalia. It read: “Voting Is My Super Power.” It brought back memories of the women whose protests and marches of nearly a century ago led to the ratification of the 19th Amendment, giving women full suffrage rights, and laid the groundwork for the continuing work on women’s rights that echoed in the speeches and was evident on the signs at the women’s marches in January 2017 and again last month. The question that remains, now that the marchers have come home is, “What’s next?” How can marchers capitalize on the enthusiasm and momentum? Today, we are seeing more women at podiums and on the stump. But to move the needle to change the ways our government functions, some lessons can be drawn from the suffragettes. 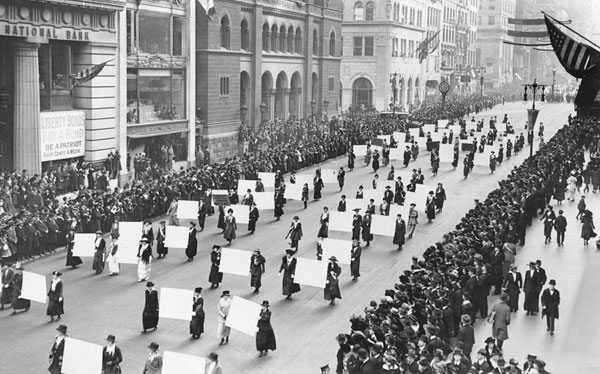 In her article in The Conversation, Liette Gidlow points to three strategies that were central when the 19th Amendment was adopted and the League of Women Voters began as a nonprofit, nonpartisan organization working to promote voting. Those strategies—Communicate, Run, Vote—are at the core of what will be key to the success or failure of the follow-up to the Women’s Marches. Considering early communication work prior to Twitter, Instagram, Facebook, and other social media, early feminists cleverly captured the market of what was then the modern media: radio, telephones, and glossy print magazines. In 1928, for example, the league partnered with the fledgling NBC radio network to bring its “Citizenship School of the Air” to 15 million listeners. At a time when callers couldn’t dial direct, telephone operators—an overwhelmingly female labor force—reminded election-day callers in 1924 to be sure to vote. Articles and ads in women’s magazines such as the Ladies’ Home Journal nudged millions of its female readers to take advantage of their newfound right to vote. Today, the communication options are many and varied and can reach different audiences. But reaching them and turning those connections into actual votes on Election Day are not always the same, as the data will show. Based on two decades of research on US history and women’s politics, I believe that today’s female activists can succeed where their foremothers failed. That means organizers will have to identify their potential supporters, precinct by precinct, and register them to vote. They’ll need to communicate with identified supporters repeatedly about shared concerns through traditional and social media channels, direct mail and—above all—in person. The canard of the outside organizer roiling up discontent doesn’t really fit when it comes to the student gun control protestors, and it may end up biting the GOP in the hindquarters.